Look out for these sublime new flavours available at selected stockists later this week. Joining the Sago Pudding range are new tropical flavours; Apple, Coconut & Lime, Mango, Dark Plum and Coconut. Chocolate Mousse addicts have two new tempting combinations to try; Salted Caramel Mousse or Duo of Chocolate and Creme Anglaise. Essence soups are now available at five Thomas Dux locations across Sydney. We'd love to receive your feedback Sydney foodies, let us know what you think. At Essence we make soup to warm your heart. Now that winter is upon us, we are delighted to introduce two new soups to our range. A healthy option for lunch or dinner on the run, the secret to our soup is that it’s made exactly the way you make it at home. There are no artificial flavours or preservatives, just delicious fresh vegetables, free-range chicken, herbs, spices and real, house made stock. Discover the taste of Asia with this authentic soup starring a full bodied bone broth, rice noodles and shiitake mushrooms. Our traditional Minestrone soup is a hearty and healthy winter warmer. Made with ham hock, kale and fresh vegetables, this soup is sure to please. Call us today to find your closest Essence soup stockist. Summer Entertaining and Party Packs! Take time out and let us cater for you, your family and friends. We have put together two amazingly priced entertaining packs - all you have to do is decide which delicious Essence flavours you want. Place your order by 10am Mondays & collect from Essence HQ in Portsea on the Friday between 9am & 3pm. Cash payment on pick up. Email your order to info@essencefoodforthesoul.com.au or call us on 59842557. Make your weekend delicious with Essence Food for the Soul. Now you can buy Essence products online and have them delivered to your home. 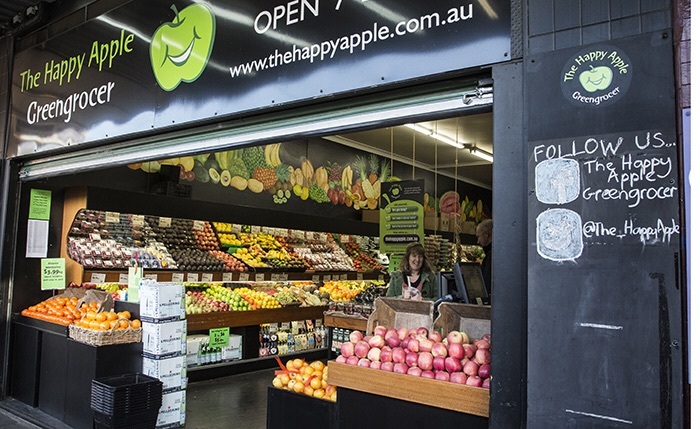 The wonderful team at The Happy Apple Greengrocer in Ascot Vale deliver to over 75 suburbs across Melbourne. Jump online and you'll find a large range of our delicious quiches, pies, meals and desserts. A little birdie told me that Essence quiches, sweet tarts and desserts will be on tasting at Mt Martha Supa IGA (8-16 Lochiel Avenue, Mt Martha) on Saturday 13th December from 10am - 1pm. Come down to try before you buy and get some great catering ideas for Christmas & the summer holidays. Gum Tree Good Food in the heart of Albert Park Village is our newest stockist. You'll find them in the old Post Office building at 87 Dundas Place. We're excited to have them on board, and to celebrate we're having a tasting. Come down to Gum Tree Good Food this Saturday to try some of our fabulous desserts. On taste will be our decadent Belgian Chocolate Mousse, Vanilla Bean Custard, Lemon & Coconut Tart and our popular Mango & Lime Cheesecake. Any of these are guaranteed to make you feel very merry indeed this festive season, so come by and start planning your Christmas dessert menu! Spring into Renaissance Supermarket at 102 Burwood Rd, Hawthorn to taste our quiches, Belgian Chocolate Mousse and Apple & Rhubarb Compote. We'll be there between 10am and 1pm. Spring entertaining has never been easier! We use free range eggs in all of our products, and they really are worth it - come and taste for yourself! We will be at Foodworks in Ascot Vale (181 Union Road) between 10am and 1pm. Di will be showcasing our Chocolate Tart, Apple & Rhubarb Compote, Belgian Chocolate Mousse as well as Mild Chicken Curry. At Essence we're celebrating the arrival of Spring. This week our sweet tarts and dessert sales were spectacular. If you'd like to have a taste we'll be at McCoppins Hawthorn tomorrow (Saturday 13th) from 10.30am -1pm with a delicious selection to try.